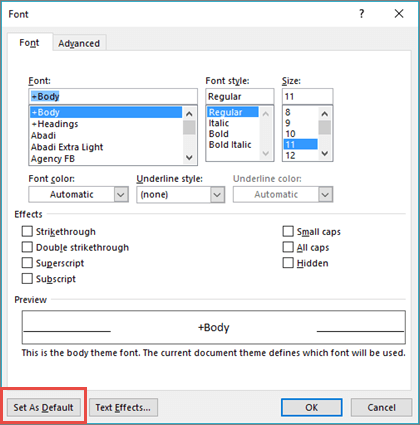 When you set a default font, every new document you open will use the font settings that you selected and set as the default. The default font applies to new documents that are based on the active template, usually Normal.dotm. You can create different templates to use different default font settings. Note: In Word, you can also quickly and easily format an entire document to give it a professional and modern look by applying a document theme. A document theme is a set of formatting choices that can include a color scheme (a set of colors), a font scheme (a set of heading and body text fonts), and an effects scheme (a set of lines and fill effects). Start with a blank document, or if your document already contains text that is formatted with the properties that you want to use, select that text. Select This document only? if you want your changes to apply to only the current document. Select All documents based on Normal .dotm template? if you want your changes to apply to any document based on the Normal template. New mail messages - Sets the default font for original messages you compose. Replying or forwarding messages - You can have a different font on messages you're forwarding or replying to. This setting is mostly for the two check boxes that let you mark your comments with your name (or other text) or with a different color of text. Select the options that you want to apply to the default font, such as font style and font size. Click OK all the way back out to save your changes. You can change fonts in your documents, but the next time you create a new blank document, Word Online reverts to 11-point Calibri. If you create a new document from a template, it may have a different default font.